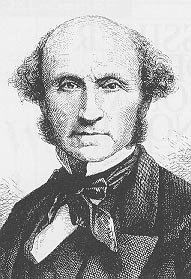 ohn Stuart Mill (1806-1873), the eldest son of James Mill, was taught Greek, Latin, mathematics, philosophy and economics from a very early age by his father. He was subjected to a rigid system of intellectual discipline, which according to Mill gave him an advantage of a quarter of a century over his contemporaries. Deliberately shielded from association with other boys of his age, John was influenced by his father's friends, in particular, Bentham, who together with James Mill, founded utilitarianism. Mill was considered one of the greatest of Victorian liberal thinkers, significantly impacting the study of philosophy through his restatements of the principles underlying philosophical empiricism and utilitarianism. Initially setting out to follow the strict utilitarian line, he was later influenced by his wife Harriet Taylor and by a severe mental crisis in 1826-1827, which made him deviate from Bentham and his father, humanising and idealising it. He became sympathetic to socialism, and he was a strong advocate of women's rights and such political and social reforms as proportional representation, labour unions, and farm co-operatives. Thus, he became a defender of individual liberty against the interference of both society and state and an early advocate of women's equality. However, while Mill advanced the cause of democracy to a considerable degree -- in 1869, he eloquently argued for the right of women to vote -- he nonetheless believed, like Plato, that "higher minds" should set the tone of society. Later in life, Mill realised that his father's methods seemed to have been designed to turn his mind into a thinking machine, so that he might become a prophet of the utilitarian gospel. Mill felt that this neglected the culture of his practical and emotional life. He had no doubts at the beginning of his career. Reading Bentham when he was fifteen or sixteen, he felt that that all previous moralists were superseded. The principle of the utility, he says, understood and applied as it was by Bentham, "gave unity to my conception of things." "I now had opinions; a creed, a doctrine, a philosophy; in one among the best senses of the word, a religion; the inculcation and diffusion of which could be made the principle outward purpose of a life." He formed a small utilitarian society, and for some years, adopted his father's philosophical and political views. A position under his father in the India Office had prevented him from having to depend on literary work for a livelihood and he found that office work left him ample leisure for the pursuit of his wider interests. Just as he was coming to be looked upon as a leading intellectual, the mental crisis occurred. This was a result of the severe strain, physical and mental, to which he had been subjected from his earliest years. He discovered that logical analysis has a dissolving effect on the associations that have been formed through his education. The things for which he had been schooled and for which he had toiled had lost their attraction. However, after many months of despair he accidentally found that the capacity for emotion was not dead, and began to see this not as an entirely negative process, since by dissolving superficial or erroneous associations, logic helps us overcome what is merely prejudice. Mill also suggests that there are some associations that will not be dissolved because they derive from true and valid connections in nature. Another important factor in his life was Mrs. Taylor, who co-authored pieces with him. He maintained a close relationship with her for many years while she was married and eventually married her in 1851, after her husband's death. ITL Web: Study Place: "Mill, John Stuart"